Frequently reliable Apple analyst KGO Securities estimates that Apple could ship 100 million of the new 6.1 inch screen LCD iPhone. 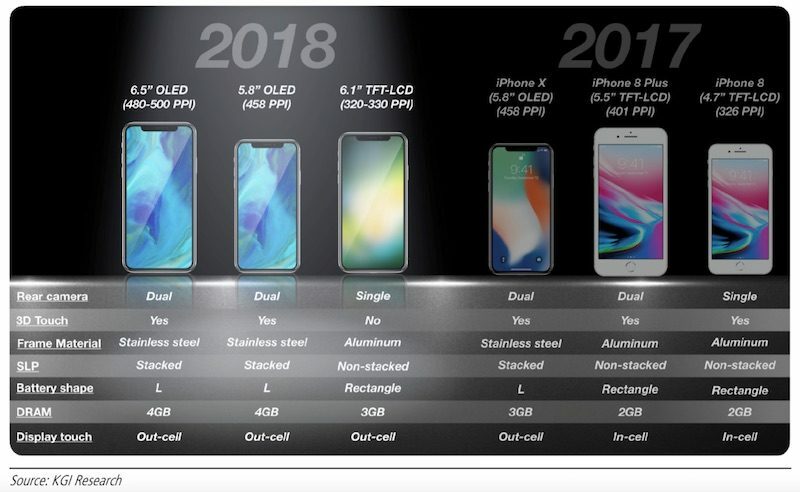 Macrumors.com says KGI has already predicted that Apple will drop the iPhone 8 and 8 Plus in favor of this new, lower priced iPhone. It won’t have the OLED screen, but will be full screen with ‘the notch.’ It also will have an aluminum frame instead of stainless steel, a single lens camera, and no 3D Touch. On the other hand, KGI says it could be priced starting at $699, which will pull in a lot more buyers than the $1000 or $1000 top iPhones for 2018. KGI thinks the lower priced model will account for half of all new iPhones after the new models roll out this fall. Magic Leap has been trying to stay under the radar until recently, when they showed a model of what their AR glasses will look like. Now, theverge.com reports that they will produce several versions, including one priced like a ‘higher end mobile phone to higher-end tablet.’ They also plan a high end version for pros and developers, but may end up with as many as 3 models in the beginning. Although dropping around $1000 for a set of AR glasses doesn’t sound cheap, Magic Leap points out that over time, the headsets can replace your phones, televisions, laptops, and tablets….which could save thousands of dollars.